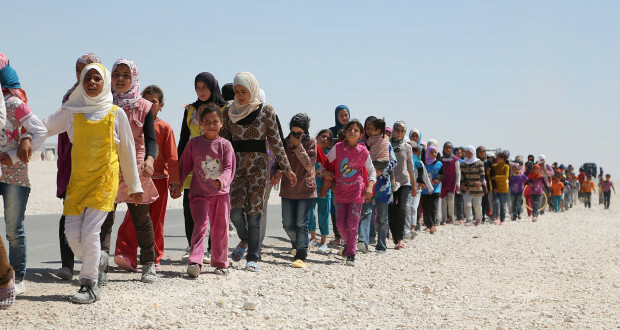 Syrian children march in the refugee camp in Jordan. The number of Children in this camp exceeds 60% of the total number of refugees hence the name "Children's camp". Some of them lost their relatives, but others lost their parents. “Never again” — a phrase reflecting the promise of international cooperation in the guardianship of human rights still stands, 70 years after the Genocide Convention of WWII, a work in progress. As Burma persecutes the Rohingya, over 900,000 refugees have fled their homes for sanctuary in Bangladesh. Meanwhile, 22 million Yemenis face cholera epidemics and starvation as Saudi and UAE forces destroy the fragile infrastructure of one of the poorest nations in the region and the Syrian Civil War has displaced millions of people seeking refuge. The degree to which mankind has failed its promise of “Never Again” begs how to resuscitate a meaningful genocide-prevention framework. Samantha Power, in “A Problem from Hell: America and the Age of Genocide,” asks, “Why do American leaders who vow “never again” fail at genocide prevention?” It is an impregnable truism that the concept of “Never Again” is the focal point of genocide prevention. Still, it is hard for the naked eye to ignore the sharp juxtaposition of America’s strategic arms deals with Saudi Arabia, a country which has killed thousands of Yemenis and starved many more in its proxy war with Iran. To me, genocide and atrocities are so blatantly severe that the decision to act cannot be made under the pretext of narrowly defined national interest or a subscription to convenient morality. We simply cannot uphold “Never Again” by picking and choosing which mass atrocities we can let slide and which we fight. To effectively uphold one of the most important promises of the century, we must use a three-pronged deontological and practical approach to the prevention of genocide and mass atrocities. First, the politics of definition must first dissipate so that an act of genocide is labeled as such. Because of the Soviet Union’s influence over the 1948 Genocide Convention, the destruction of only certain kinds of groups- national, ethnic, religious, and racial- are deemed as genocide. The notable exceptions from the list, including political and economic cohorts, are often exempted from the international stage. As it is, this hole in the definition is giving rise to many new violent states such as Burma, which skirt around the term genocide by citing “political rebellion” as the cause of violence. With this change, we can easily invoke the Rome Statute of 1998 which created the International Criminal Court and investigate criminal agents promptly. The I.C.C.’s recent prosecution request for jurisdiction over the Burmese military’s alleged crimes could have happened, for instance, in 2015 when the issue was conspicuously gaining traction. Accountability under the International Law is important both in bringing justice to victims of genocide and setting precedent for how and when future abuses of power are dealt. Furthermore, to avoid Ad Hoc or punctuated policy, it is also necessary for countries to define the prevention of genocide as a “Core National Interest”, much like the U.S. did under the Bush administration and President Obama presidential directive, so that they can pursue diplomacy with high-level leaders and non-state actors before conflict escalates. Prevention using a causative approach is the best manner to prevent mass atrocities is defined by the identification of early predictors of genocide, including the recognition of factors such as a nation’s history of discrimination, conspicuous power imbalances between ethnic groups, and radical nationalism. For example, studying the history of Sudan would have pointed to the negative sentiments against non-Arabs in the region before the third civil war. Other major interrupters in the political stability of the country, such as the assassination of the Hutu president before the Rwandan Genocide, can serve as effective predictors for mass atrocities. We ought to invest in these effective early warning systems, such as those employed by the U.S Holocaust Museum, to prevent mass atrocities in their earlier stages. Once a state shows signs of intergroup tensions, other methods of comprehensive early intervention ought to be employed. While peace-building plans will likely vary considerably depending on the nature of conflict, horizontal interventions can have wide-ranging benefits which go beyond atrocity prevention. Building a responsible national media, training the local military in human rights protection, and strengthening the presence of peacekeeping organizations in at-risk nations can help prevent the rapid miscalculation often involved in genocide. Other diplomatic pressures such as economic sanctions or withdrawal of military aid should be used in conjunction with diplomatic meetings with heads of state, while institutions such as the World Bank should increase aid given to humanitarian organizations to support victims of atrocities. “Never again” stands as the greatest international promise in history, affirming the protection of human rights over Statehood and political idiosyncrasies. But without a proper framework to define genocide and identify early predictors of conflict, the international community will be forced into a reactionary position with limited options for intervention. It is when we proactively engage to scope internal political tensions that we can practice peacekeeping and early mediation as an alternative to ethnic violence, refugee crises, and war.